Copper has seen a real slowdown in demand and the metal is taking its biggest beating since the start of the global recession. The story isn't much better for gold as it faces its biggest monthly fall since 2008. It is currently trading at $1627 and is showing support at $1604 and resistance at $1653. The gold market volatility continues and as other currencies just about have the edge on the Dollar this morning, the precious metal is seeing a little bit of strength early on. The yellow metal is currently trading at $1632 following a weak session in Asian overnight. Bulls will be looking for a test of resistance at $1675 meanwhile they'll be hoping support at $1600/1585 and then of course the major recent low at $1535 will hold up. The roller coaster that is gold has found a bit of calm in the last couple of days. The gold market is at $1654 at the time of writing and the bulls will want to test yesterday's highs around $1676. At the same time, in the near term they'll be hoping support around $1630 will hold up. The mass shake out earlier this week will have interested many people who've been waiting for a sharp correction like the one we saw so they could go long. For now the long term uptrend is still very much intact so a test of the all time highs in the future should not be ruled out. With uncertainty about European debt potentially threatening to push the world back into recession, investors would usually expect to see risk averse market participants piling into safety havens such as gold. This was not the case in yesterday's session, where it appeared the favourite asset was cash as near future liquidity issues were on the minds of traders. After plummeting to an intraday low of $1532.0, gold settled at $1627.3 and this morning it's trying to claw back some of the recent losses as it trades at $1623.0. With fear of repeating myself, there is still doubt over future oil demand as the US economy's future still looks bleak and this caused Brent crude oil to dip down to $101.65. Nevertheless, a rebound in the equity markets and a weakening US Dollar late in the session helped crude to just pass the halfway line and close in positive territory at $104.95. At time of writing it's still on the climb, trading at $105.29. Gold is the fall guy today and, at the time of writing is at $1592, a good bounce off its lows from earlier though. This $250 decline since Thursday has the feeling of a bubble being popped but even still the long term upward trend still remains intact. The yellow metal was heading for its worse two-day drop since 1983. It's a difficult one really, because when do you think enough is enough and buy the dip? Either way, for most, it will always be seen as a safe haven, so who knows how much longer it will be before some think enough is enough and dip a small toe in? Gold has managed to hold onto the $1,700 as bulls continue to get a little nervy about the precious metal's recent weakness. This morning gold is seeing a little bounce to $1,747. Like gold and the stock market indices, crude oil prices are a little strength this morning. Following its substantial falls yesterday, the crude oil market is up 60 points to trade around $106.00 with Capital Spreads. For the Brent crude oil bulls the fear is that, like its US cousin Nymex, we could see the price test the psychological $100 level soon. Gold's support, provided by the weaker dollar, was nowhere to be seen yesterday. The gold market failed to gain any ground from the Federal Reserve announcement of the near-to-far $400 billion bond liquidity switch. In fact, the metal fell in tandem with equity markets. It seems that traders prefer to use the greenback as a safe haven in the short term and yesterday's drop resulted in the precious metal falling below its 40 day moving average. At time of writing, the losses are being extended and the gold market is trading around the $1,771.0 level with Financial Spreads. The Department of Energy's inventory numbers took hold of crude yesterday and gave it a boost after announcing a drawdown in stocks in excess of 7 million barrels. This rally was later reversed after the FOMC stated they were selling out of their short term bonds and buying into longer term bonds. This weighed on crude oil and caused it to drop to recent lows. 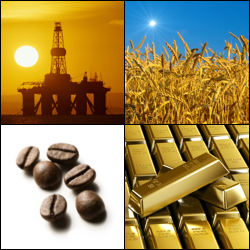 The fall hasn't stopped this morning and the commodity CFD trading market is trading down at $108.21. Bargain hunters did not wait for gold's lower support of $1,750 yesterday before jumping into the safety haven, helping the metal claw back some of the previous session's losses. Most market participants will be looking at the FOMC meeting this evening. At time of writing, the precious metal is trading up on the day at $1,812.0. Crude oil was given a chance to breathe yesterday as global markets saw little movement. Without any negative news being released, stock markets were given a chance to regain their balance and the area of little resistance was on the upside, even with the dollar showing weakness against the Euro. Although eyes will be on the inventory numbers this afternoon, the main crude oil drivers are, for the foreseeable future, macroeconomic indicators. At time of writing Brent is trading at $110.76. Gold's safety haven status was nowhere to be seen yesterday. Investors were drawn more to the greenback and government backed bonds for protection of their money, as riskier assets such as commodities were out of favour due to hovering concerns over Greek debt and US growth worries. If the current support is broken, then traders will look for the next technical level of $1750.0 and it will be interesting to see if there are any bargain hunters in sight. Fear was caused yesterday by the lack of any firm rescue package agreement on the cards for Greece and markets in both the US and Europe. This fear helped push crude oil prices lower. On top of this, the US dollar was given a strong boost on the back of the same woes, which only added to the pressure on crude. At time of writing, the liquid commodity hasn't seen much action, as it's trading around flat at $109.39. To state the obvious, gold has been keeping its safe-haven status amid the recent volatile markets and has consistently been trading with a negative correlation to world stock markets. The trading session on Friday blew the previous statement out of the water and after dipping past the previous day's lows, it then followed on to rally $60. It looks as though market participants didn't want to leave their shorts on over the weekend and were happy to buy even with both equities and the dollar rallying. At time of writing, the metal is continuing its rally and trading at $1,825.0. The strength shown in the greenback and the equity markets gave mixed direction for black gold on Friday. After failing to break the $90 level once again, the seesaw was tipped and the bears took hold of the reins, putting pressure on the US contract and sending the market plummeting, wiping out weekly gains. And things aren't changing this morning, with oil opening the session weakly, trading a dollar lower than Fridays close amid fresh single currency woes.